Scott Frost talks about his new one pocket DVD and Darren Appleton talks about his 2010 Player of the Year award. Pat Fleming talks about his live instructional videos and Gabe Owen talks about one pocket and his new instructional one pocket DVDs. Jerry and Mike talk about the US Open and other recent billiards news. Barry Behrman talks about the upcoming US Open 9-Ball Championship. Johnny Archer talks about the recently formed Association for Billiards Professionals. The “player of the year” show with Mika Immonen and Jasmin Ouschan. Dennis Hatch talks about the 2009 Mosconi Cup. 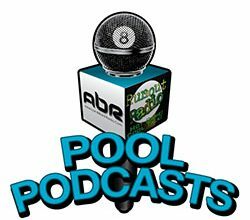 Darren Appleton talks about his career and Mark Griffin talks about the National Championship Series and the state of pool. Johnny Archer and Allison Fisher talk about their careers and their induction into the BCA Hall of Fame. President Dawn Hopkins discusses the WPBA as well as the BEF Program. Jerry and Mike discuss the Junior World Championships, Reno Open, Mosconi Cup and 2008 Players of the Year.Then Ralf Souquet discusses his Player of the Year win, the Mosconi Cup, the Euro Tour and how to keep sponsors happy.